Greenwell is an independent specialty supplier of completion and production services for the upstream energy industry. Its solutions span proprietary-blended chemicals, well stimulation, chemical delivery systems and wholesale equipment that drive efficiencies and reduce clients’ operating costs. The company operates nine offices across the Southern U.S., serving hundreds of customers and treating thousands of wells in the Gulf Coast region including Texas, Louisiana, Mississippi, Oklahoma and the Gulf of Mexico. We leverage in-house manufacturing and blending services to design solutions for customers’ specific applications. Most of our customers find they can use fewer chemicals and achieve better results with our highly effective chemicals. Through countless R&D hours and rigorous testing via our in-house laboratory and the field, Greenwell is able to ensure its solutions perform reliably on every project. We leverage technology to help our customers be more efficient and reduce manual processes and systems. Our highly automated Data Acquisition System (DAS) mixing plants reduce clients’ costs through optimal chemical utilization and exact injection rates. 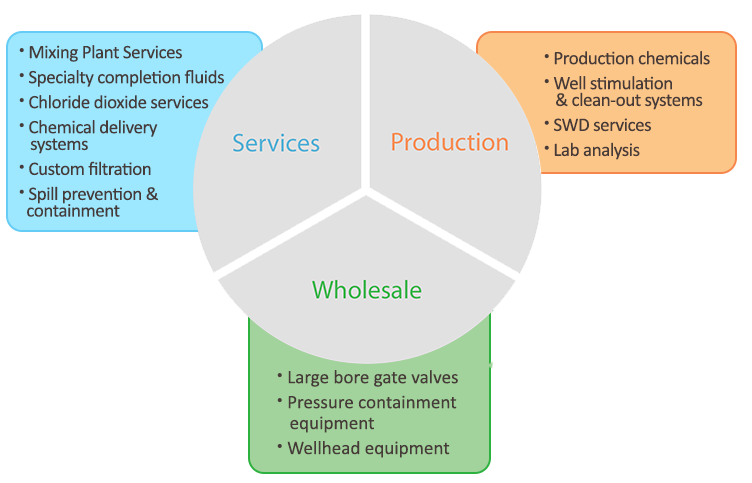 Our well stimulation service removes debris from the wellbore to boost production immediately. We also provide production chemical maintenance services to maintain the highest production possible. Our well stimulation and cleanout service works for oil, gas, injection and saltwater disposal wells. We provide quality oilfield equipment that’s immediately available at affordable prices for wellhead and FRAC valve rental companies. Our inventory includes large bore gate valves, pressure containment equipment, wellhead equipment and other components. We provide high-performing solutions that minimize customers’ environmental footprints.